These dogs take their name from the mountain range in southwestern Europe, where they long have been used as guardians of the flocks. In the United States they are called Great Pyrenees. In the United Kingdom and on the continent of Europe, they are known as the Pyrenean Mountain Dog. In their native France, they are Le Chien de Montagne des Pyrenees or Le Chien des Pyrenees. Whatever the name, it is a beautiful, primarily white dog with a “certain elegance” which for centuries has been the working associate of peasant shepherds high on the mountain slopes. 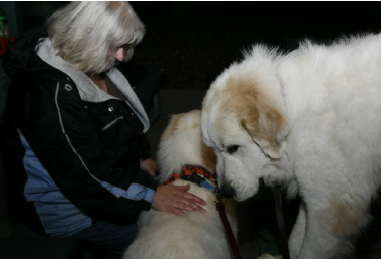 The Great Pyrenees is a lupomossoloid as opposed to a mossoloid. While there has surely been some cross-breeding over the many centuries, the Great Pyrenees is not a mastiff nor are its lupomossoloid ancestors principally from the mastiff family. There are other dogs of the region, such as the Pyrenean Mastiff, and the Spanish Mastiff that fill that description. It is no coincidence that the Great Pyrenees is approximately the same size as the European Grey Wolf. The Great Pyrenees is a mountain shepherd’s dog. 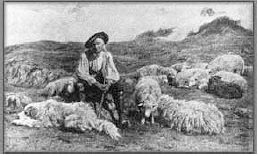 Over this long period of time the Great Pyrenees developed a special relationship with the shepherd, its family, and the flock. In 1407, French writings tell of the usefulness of these “Great Dogs of the Mountains” as guardians of the Chateau of Lourdes. In 1675, they were adopted as the Royal Dog of France by the Dauphin in the court of King Louis XIV, and subsequently became much sought after by nobility. Having a precocious sense of smell and exceptionally keen eyesight, each dog was counted equal to two men, be it as guard of the chateaux, or as invaluable companion of shepherds. While their royal adoption is interesting, the dogs main fame was from their ageless devotion to their mountain flocks, shepherds, and shepherds’ family. When not working the flocks, you would find “Patou,” as he is lovingly called, laying on the mat in the front doorway of the shepherds’ humble dwellings. In 1662, dogs were carried to Newfoundland by Basque fishermen as companions and guardians of the new Settlement. Here it was they became mated with the black curly coated retriever, favorite of the English settlers. This cross resulted in the formation of the Landseer (black and white) Newfoundland. In 1824, General Lafayette introduced the first pair to America by bringing over two males to his friend, J.S. Skinner, author of “The Dog and the Sportsman”. In 1850, Britain’s Queen Victoria owned a Pyrenean Mountain Dog, and in 1885-86, the first Pyrenean Mountain Dogs were registered with the Kennel Club in London and shown at the Crystal Palace. In 1870, Pyrenean blood was used with that of other large breeds to help bring back the St. Bernard after that noble dog’s numbers had been so greatly depleted by avalanches and distemper at the hospice in Switzerland. It was not until 1909 that the first Pyrenean Mountain Dogs were introduced into England for breeding purposes by Lady Sybil Grant, daughter of Lord Roseberry. It was twenty-six years later (1935) that Pyreneans were again bred in a kennel in England. At that time, Mme. Jeanne Harper Trois Fontaines started her de Fontenay Kennel at Hyde Heath, Amersham, later becoming well known the world over and accounting for many exports to distant lands. By the late 1800’s and early 1900’s the state of the breed had deteriorated due to the vanishing of the natural predator foes in the mountains and the practices of many unscrupulous breeders selling to naive tourists through the region. In 1907 Monsieur Dretzen from Paris, along with Count de Bylandt of Holland and Monsieur Byasson of Argeles Gazost, formed the Club du Chien des Pyrenées (CCP) a.k.a. Argeles Club in Argeles Gazost. They combed the mountains for a group of “faultlessly typical” specimens. Monsieur Dretzen took these dogs back to his kennel in Paris. Also in 1907, the Pastoure Club at Lourdes, Hautes Pyrenées, France, was organized to perpetuate interest in the breed. Each club wrote a breed standard. After the decimating effects of World War I, the breed’s numbers and quality had been severely compromised. A few dedicated breeders, headed by Monsieur Senac Lagrange, worked to restore the breed to its former glory. They joined together the remnants of the two former clubs and formed the Reunion des Amateurs de Chiens Pyreneans which still exists today. It was this club that was responsible for the breed standard being published in 1927. This standard has served as a basis for all current standards for the breed. After World War II, it was again Monsieur Senac-Lagrange who took the lead in getting the breed back on its feet from the devastating effects of the German occupation.